Aside from the initial research in my four chosen themes, namely Poetry, Abstract Art, Geometry, and Mathematics, I also spend Week 3 attending our regularly scheduled workshops and lectures. This Tuesday during our morning Tech Workshop session, we dived deeper into Fundamental Calculus, exploring some more essential concepts such as the Product Rule, the Chain Rule, L’Hôpital’s Theorem, and the Squeeze Theorem. For the most part, everything we covered made sense and connected quite nicely with the material from the previous weeks. I also quite appreciated having the proof for all of the theorems and rules covered as that was the way that the connection between all of these different principles was established for me. By using the definition of the derivative and other basic properties of functions and limits, we were able to establish why the Product Rule, the Chain Rule, and the Squeeze Theorem were in fact accurate. It was rather nice to see how the knowledge stacks up and how all of these elements are interconnected and thus allow for us to build up to more complex and exciting things. Possibly the most exciting part of the lesson to me was proving L’Hôpital’s Theorem geometrically by using the Squeeze Theorem, as that solution was rather visual, which tends to make more sense to me as a general rule. Overall, I’m excited to see where this journey through Calculus will eveturally take us and I look forward to applying some of principles in my practise, specifically when it comes to physics, movement, calculating trajectories, and more. Below I have attached my work and notes from our session. Notes from class, showing my work and progress for that session. After our session on Calculus we proceeded to the Building the World session, where we covered Matrices and basic operations one could do with them. Matrices are key to understand as they are essentially the building blocks of Markov Chains, which is what we are really interested in as games designers, but more on Markov Chains next week. For this class, we took a look at what matrices are, their basic definition, how one can add or subtract two matrices of equal rows and columns, how one can scale a matrix, and most interestingly how one can multiply two matrices. I found the majority of these operations quite straightforward as they did not go far beyond basic arithmetic, although I did take a couple of attempts to get a hang of the multiplication procedure. The process itself was not overly complex, but the first time I tried, I found myself losing track of which set of numbers I was on, which I reckon is probably an attention issue more that anything else. After I realised my first result was a bit off, I had another stab at it, and figured it out relatively quickly. Overall, I quite enjoyed learning about matrices as they are essentially a way of managing data and the relationships between data. Matrices can are used in computer graphics, managing computer-generated reflections and distortion effects, geometric transformations, listing probabilities and outcomes of the same trial, and more. 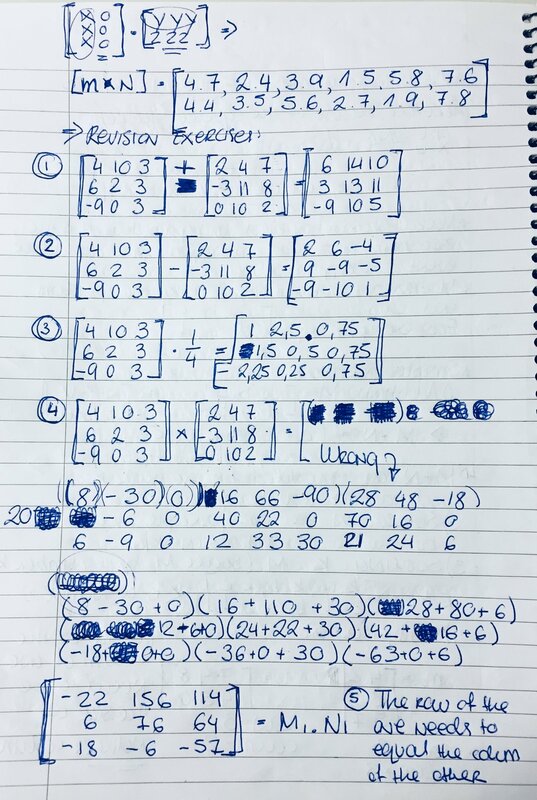 Below I have included my work on matrices from the sessions (including some excessive crossing out of errors). Application of Matrices in Video Games for the creation of Reflection and Distortion Effects. The Friday of Week 3 was predominately dedicated to the presentations of our four themes, where we were meant to give and receive feedback on which themes we found the most exciting. The process started off quite well and I felt quite enthusiastic about helping people out with resources they should look at and questions they may want to consider within their given topic. However, although the day started off rather smoothly, it was quite draining later on due to the large number of information presented and a series of technical issues throughout. Nonetheless, we marched forward and continuously gave feedback and voted on our favourite themes, obtaining a large documents with people’s thoughts on the subjects presented. When it came down to my own presentation, I was trying to fit a large amount of information on all themes into a reasonable time frame, so I ended up speaking mostly from a place of passion about the topics rather than from my predetermined script. I think I managed to fit the most important bits and pieces in and to show why these particular themes are so exciting, however the audience would be the best judge of that. Once my presentation was over, I took a look at the notes I received (both attached below) and was quite pleased with them as they gave me a series of links and potential research avenues, including a number of people to talk to about the topics. When it comes to favourites, Geometry got the most love from the class, which I greatly appreciate as it is a very exciting visual and ma thematic field. However, although Geometry was the favourite topic of the class, I decided to focus my research on Mathematics because I am greatly interested in the field as a whole and I do not want to limit myself to that specific section of Maths. Mathematics in itself incorporates Geometry, however, it would also allow me to continue exploring the idea of Chance, Probability, and how one would go about manipulating and controlling them. I’m quite excited to dive deeper into these topics and hopefully, this will lead to exciting research avenues and the potential for some fantastic game ideas. In addition to the discussion around everyone’s themes and chosen topics for further research, we had a rather useful workshop on the Friday, which gave us a method for focusing our research and coming up with large bodies of it in a relatively short amount of time by using prompts such as Colour, Shapes, and more. Richard and I took a look at the Colours of a variety of Habitats and filled the OneNote folder the class was working on with a series of exciting colour schemes from different parts of the world, which you can have a look at below. Overall, I thought this method of research is rather useful, especially when struggling to find a starting point or a focus. I am not certain I will apply it religiously to my own work as I have grown to research specific questions and find answers to them. However, if I am ever in a position where I can’t quite come up with a question or am feeling stuck in general, I will surely turn to these prompts and starting points. Overall, Friday was rather busy and draining, but also quite productive. Decisions have been made on where to next and from here on out it’s a matter of getting all of that research done. And so we beat on. The simplest possible mathematical definition of Probability would be the chance of a certain event taking place. As we have covered the basic definitions and methodologies behind Chance and Probability in James’s Tech Workshop and Building the World Sessions, I will proceed on straight to more advanced concepts we have not gone over. If you would like a more basic overview of Probability, please refer to Week 1: A Welcome Return and Week 2: Calculus and Cancer. Die are a fantastic way for obtaining a random number. This connects to my research in Geometry as die are only produced in the shapes of the Platonic Solids and another set of solids known as Fair Die. The concept of Fair Dice is quite exciting to me as that’s a meeting point between the study of Chance and Probability and Geometry. In mathematics, Fair Dice are solids which offer an equally likely chance to land on any one surface of the object. Following that definition, all of the Platonic Solids can be considered Fair Dice, including the most popular dice, the Cube (for more information, please refer to Week 3: Research on Geometry). However, there are a variety of shapes that are not necessarily Regular Polyhedrons, but can be used as fair dice. The main requirement for dice to be considered fair is that the overall geometric shape of the dice must remain unchanged and symmetrical, regardless of which face it is landed on. If we were to explore the concept in even more detail, we would also have to consider how the real world affects the way die land, and whether or not it is possible to influence its tumble, however, that’s a related to physics rather than pure mathematics. What’s exciting about Fair Dice is the variety of probabilities they offer, more so than a traditional six-sided one. If I were to design a Board Game, I would look into a variety of Fair Dice, and I would use the Binomial Distribution Formula from my prior research to estimate what odds would be most appropriate for my design. For more information on Fair Dice, I highly recommend the video below by Professor Persi Diaconis from Stanford University, who is an expert in the field. A fascinating problem surrounding Chance and Probability is the so-called Monty Hall problem. Monty Hall was a TV Presenter of the popular Quiz Show Let’s Make a Deal. The simple premise of the show is that contestants are presented with three doors, one of which conceals an impressive prize, while the other two do not contain anything of value. For ease of reference, let’s note the three doors as A, B, and C. If a contestant has selected door B, for example, they have a 1/3 chance of hitting the jackpot at that point. After the contestant’s first selection, Monty Hall does not give them the results straight away. Instead, the TV presenter reveals another door, Door A for example, which contains nothing valuable. What’s crucial here is that Monty knows where the jackpot is, and he purposefully shows the contestant a door with nothing of value. After this has been revealed, the player is then asked whether they would like to change their mind about Door B and opt for Door C, instead. Monty Hall during a section of the game show. Select Door A - Door A is the correct answer - One of the two remaining empty doors has been revealed - We switch - We loose as Door A was correct all along. Select Door A - Door B is the correct answer - The only other empty door, Door C, has been revealed - We switch - We Win. Select Door A - Door C is the correct answer - The only other empty door, Door B, has been revealed - We switch - We win. If we were to always remain with our original choice, there is only a 1/3 chance of us being correct, as we were originally presented with the three options. The change in circumstances and statistical probability occurs once one of the empty doors is revealed. These results are purely the cause of Monty Hall’s knowledge of the contents of each door. If he was unveiling them at random, and happened to unveil an empty door, then the chance of either of the remaining options containing the prize would in fact be 50/50, which is what intuition suggests. The Monty Hall problem illustrates a key aspect of Chance and Probability that greatly interests me, which is the manipulation of chance, and how we as designers can have absolute power and control over these circumstances. Mathematical formulas such as the Percentile Mechanic and the Binomial Distribution Formula allow us to calculate chance and then manipulate it to fit our needs or make educated decisions about how to handle a situation. Knowing these principles gives us incredible control as creators and allows us to grab a hold of our universe and make it fit our design as we please. 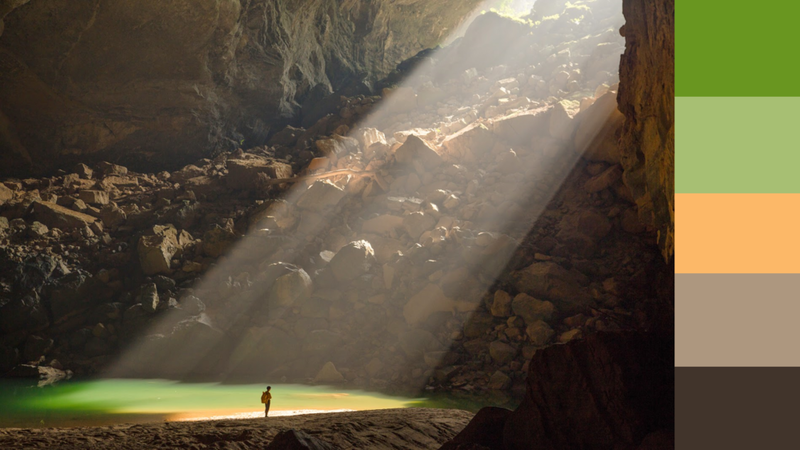 Controlling chance and probability has immense power, and at that point it can even connect to the philosophical debate of fate against free will. An interesting question to consider would be if fate and destiny can possibly exist in a universe where one has control over coincidences and chance events. An interesting follow-up question would be whether fate can be defined as pure chance or if there is more to the concept than that. Polyhedrons are rather fascinating as they are essentially constructed from two-dimensional faces, which meet at straight lines and vertices in three-dimensional space. There are a numerous polyhedrons out there in the world, but the most common type of polyhedrons are known as Irregular Polyhedrons. Irregular Polyhedrons do not tend to have much symmetry in comparison with the Platonic Solids, which I will be taking a look at shortly. A major group of Polyhedrons are the cuboids, which are Polyhedrons that have three different rectangular shapes for their sides. Some examples of cuboids include bricks, most PC cases, books, etc. Another major faction of Irregular Polyhedrons are pyramids, which tend to have irregular triangular sides, with the exception of square-based and pentagon-based pyramids. What’s most exciting about polyhedrons is their very nature of construction, featuring zero-dimensional (vertices), one-dimensional (edges), two-dimensional (faces), and three dimensional components (the whole polyhedron). These familiar and easily accessible shapes have a multitude of dimensions embedded in them, which I find absolutely fascinating. The Platonic Solids were first explored by the philosopher Plato, who held them in exceptionally high regard. Pluto even believed that these five shapes were essentially the structure of the universe and assigned an element to each one. He believed that the tetrahedron corresponded to fire, the cube to earth, the octahedron to air, the icosahedron to water, and the dodecahedron as the constellations of the universe. What I find incredibly exciting about the Platonic Solids is that they change their shape when moving between two-dimensional and three-dimensional space, yet they somehow maintain their mathematical properties and information. This is the transfer of the same data between two dimensions, this idea of information transcending the borders of reality through mathematics. Additionally, the Platonic Solids are the only ones that have perfect mathematical symmetry in three-dimensional space. This means that there is a form of perfection that can be obtained and visualised through mathematics, which could have a variety of applications in numerous fields, for example, Data Visualisation. Pentachoron - built from five tetrahedrons. Tesseract or Hypercube - built from eight cubes. Hexadecachoron - built from sixteen tetrahedrons. Icositetrachoron - built from twenty four octahedrons. Hecatonicosachoron - built from one hundred and twenty dodecahedrons. Hexacosichoron - built from six hundred tetrahedrons. Polychorons and Regular Convex Polychorons are incredibly exciting for much of the same reasons Polyhedrons are. Polychorons can be represented in four separate dimensions, their shape and appearance changing through each one. However, the transfer of mathematical data and information regarding the number of vertices, edges, faces, is all constant regardless of dimension. What’s even more exciting here is that information goes into the fourth dimension, which humans oftentimes have difficulty even imagining. Therefore, Polychora surpass the capabilities of human perception and all we are left with to interpret it are representations of the fourth dimension in three-dimensional and two-dimensional space. An exciting research avenue here is how does one represent that which cannot be perceived. Examples of regular Polychorons. It is important to note that the examples above are concave or starry Polychorons, which slightly differ from the concave ones described above. According to Google Dictionary, the definition of the word “Abstract“ is “Existing in thought or as an idea but not having a physical or concrete existence.” Therefore, Abstract Art would be art that does not represent concrete visual reality or existing objects, but rather uses other methodologies to achieve its effect. Some of the numerous tools at the disposal of abstract artists include manipulation of composition, of colour, geometric shapes, texture, layering of paint, the process of applying the paint, its specific pigments, consistencies, and more. All of these physical tools and processes are used to convey higher meaning, to help the audience get a greater understanding of themselves and the ideas conveyed. Abstraction explores that which may not be seen, it represents ideas, emotions, metaphors. It tackles the invisible, it takes complex concepts and makes them visual. Additionally, abstract art places emphasis on the viewer and is highly dependant on their vision of the work, allowing for dozens of different viewpoints and possible meanings behind a single piece. Abstract Art and Poetry are similar in that they are more about what can be interpreted, contextualised, and analysed, rather than what is literally represented on the page or canvas. There are numerous notable styles and artists who have turned the entire art world on its head, however, I will go into greater detail about the ones I personally find most fascinating. 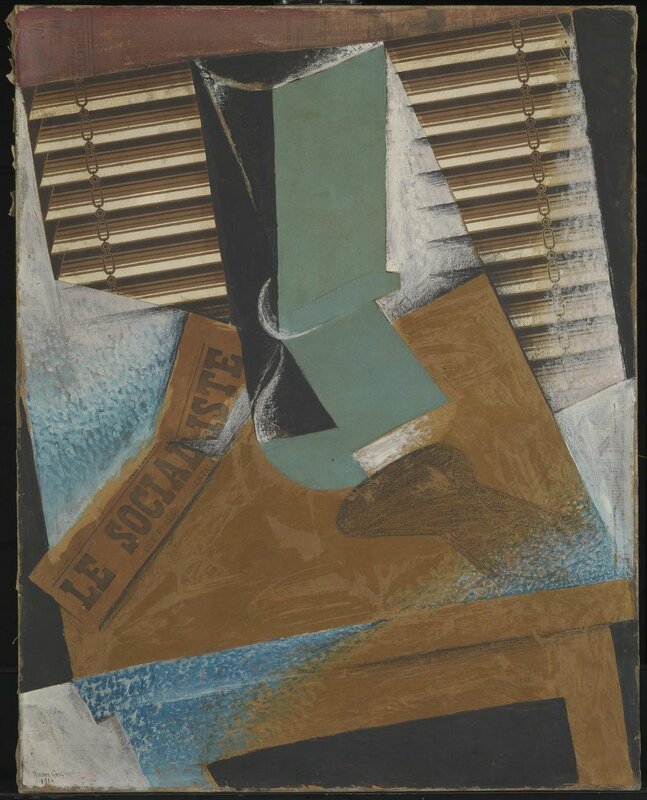 Analytical Cubism - These are the very early days of Cubism, from about 1908 to 1912, when the works were mostly fragmentary in nature and were especially focused on the representation of multiple viewpoints in the same work. Synthetic Cubism - Synthetic Cubism is characterised by the inclusion of real world objects into the art pieces and the merging of visual reality and the reality of the work. Synthetic Cubism tends to feature brighter colours and simpler shapes. The idea of deconstructing objects, of taking their individual planes, colliding them together, and making all viewpoints visible is absolutely fascinating to me. It’s a way to take three-dimensional shapes and objects and make all of their sides visible on the same place. Additionally, adding physical and collage elements to works makes them transcend the canvas and enter the space of reality. These works contain actual real-world objects that have been twisted and perverted until they are no longer themselves, all in the name of conveying an idea, emotion, a message. The shifts between dimensions, transcending realities, all focused in the artwork. M.C. Escher’s work is absolutely fascinating to me as it completely breaks down any sort of borders between mathematics and artistic endeavour. He is famous for his extreme precision, accuracy, technical capability, and incorporation of fantastical elements. His manipulation of perspective, his seamless transition between dimensions, his impossible architectural constructions and optical illusions, all made without the assistance of modern digital technology, are a testament to his undeniable skill and extensive knowledge of construction and artistic principles. M.C. Escher’s work represents complex and abstract concepts such as infinity, dimension, and tessellations. He manages to represent that which cannot necessarily be seen by humans and gives his own interpretation on the invisible, the impossible. However, Escher was not exclusively interested in representations of the invisible and mathematical concepts and principles, he also represented existentialist ideas, as illustrates by one of his most famous pieces “Ascending and Descending“ which represents the notion of a a staircase going nowhere. Alliteration -Alliteration is the conscious repetition of the initial syllables of within proximity of each other. Alliteration can be used to add melodic value to a poem or to accentuate a certain sound and the meaning behind its words. Metaphor - Metaphors communicate meaning and ideas by stating that one object is another. There is no direct comparison through words such as “this is like that“, but rather metaphors state that “this is that“. Metaphors add an additional layer of meaning and complexity within poetry as they force the audience to analyse what is being said and to interpret the work by making these emotive connections. Symbolism - Much like the Metaphor, Symbolism uses one object to represent another, straying away from the literal meaning of a word to give it more significance and value. Symbols are traditionally universally recognised in culture, for example the Apple as a symbol of knowledge. Allusion - An allusion in poetry is an intentional reference to a specific historical, mythic or biblical event, a person, a movement, a work, etc. With allusion, it is typically up to the audience to make the connection and fit it into the context of the poem. Meter - Meter is the rhythmic structure of a verse or a series of verses. It can be consistent throughout a poem or it can shift, depending on the effect a poet would like to achieve through it. Meter is most commonly concerned with the number of syllables, stressed syllables, and how often they appear based on intervals of time, however, there are other possible methods, for example qualitative meter which deals with the weight of a syllable. What makes poetry so exciting is the possibility to communicate any conceivable idea and emotion though the use of tools such as the ones listed above, through the careful craftsmanship of language, the contextual meanings of words. It begs its audience to dive deeper into the work and to think about what is being said. An additional layer of difficulty and challenge within poetry is that it typically considers elements such as syllable count, repetition of certain sounds, melody, and meter. It holds the potential for endless expression, while also following logical rules and limitations, making it an incredibly versatile medium. Lady Lazarus is one of Sylvia Plath’s most famous poems, which is often used to illustrate her overall style of writing. It is a direct reference to the New Testament, specifically when Jesus resurrects Lazarus from the dead. In “Lady Lazarus“ this is used to signify the narrator’s seeming resurrection from two past suicide attempts, one accidental, one intentional. The reason I am taking a closer investigation and analysis of Sylvia Plath’s poem is her use of allusion and startling imagery, specifically her references to the horrors of concentration camps. Through the use of language and those poetic devices, Plath is trying to show that her psychological and mental struggles are equally painful and torturous. Plath expertly represents human agony, anguish, and describes her own body as dead by comparing her face to fine Jew linen, which was typically used to wrap the dead in. Overall, Plath’s work is full of metaphors and symbolism, using language to convey meaning beyond the literal translation of words. This makes her poetry and excellent example of the power of this form of literature and its incredible versatility in the use of language. The Raven is arguably Edgar Allan Poe’s most famous poem and it is known for its melodic qualities and for its themes of hopelessness, despair, inevitability, and certainty. Unlike Lady Lazarus, which is primarily focused on metaphor and symbolism, The Raven also takes advantage of melody and harmony by taking advantage of a fairly strict meter and rhyming scheme. Specifically, the Raven is mostly in trochaic octameter, while its predominant end-rhyme scheme is ABCBBB, which frequent use of alliteration and internal rhyming. What specifically interests me in The Raven in terms of themes, is the idea that one cannot fully trust what they are seeing and hearing when it comes to loss and grief. The narrator has found themselves in a state of seemingly eternal and relentless suffering over the loss of a loved one and it feels as though there is no salvation at all. The question becomes whether what the narrator is experiencing is real, a dream, or some form of self-constructed hallucination. It’s a matter of questioning one’s own senses, identity, and experiences. The Raven is a culmination of theme and rhythm, taking full advantage of language’s properties in both meaning and sound.